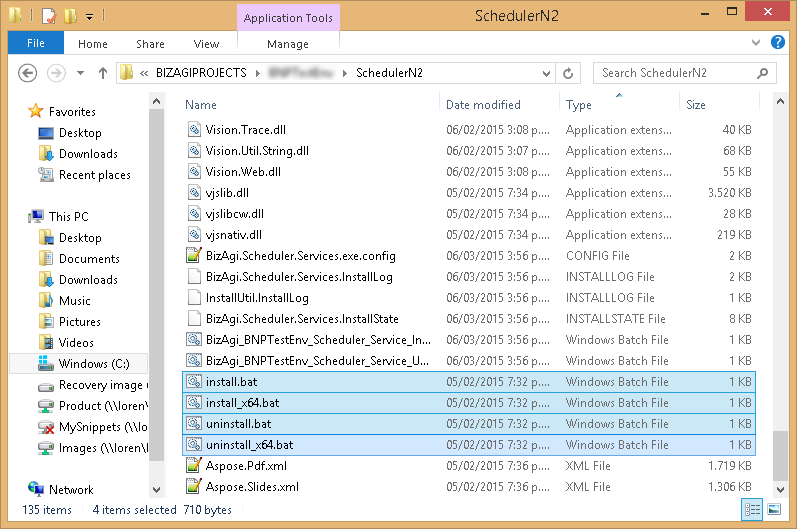 Each Bizagi project needs an installed service called the Scheduler on its Automation Server. The Scheduler is a Bizagi agenti which is in charge of performing system maintenance, offline and asynchronous tasks, and other jobs that run in the background and can be scheduled (set to run periodically). 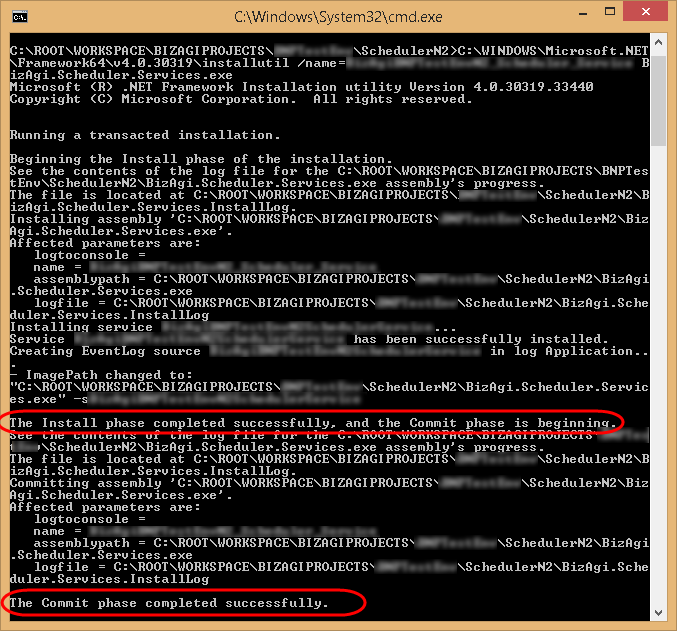 When running your processes in a .NET platform, the Scheduler runs as a Windows service with its name refering to the specific project's name. 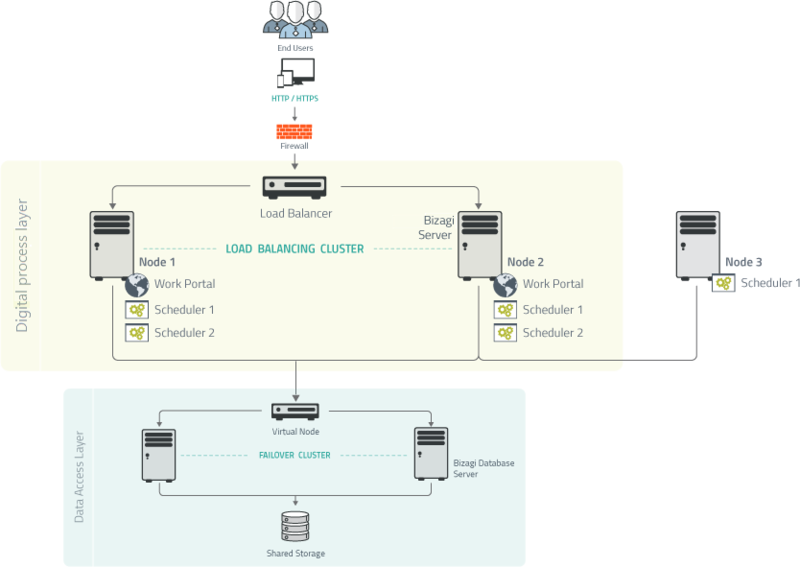 The Scheduler is supported in cluster configuration, to support load balancing of background tasks. When setting up multiple Scheduler instances, even if you have more than one service per node, we recommend that you set these up as independently as possible (each using its own dedicated server and resources). This helps avoid single points of failure (a failure in one node, it does not affect more than one Scheduler instance). For example, you may have separate servers running Scheduler services (if helpful for your project), independently of the Work Portal of Bizagi. Why configure multiple Scheduler services? 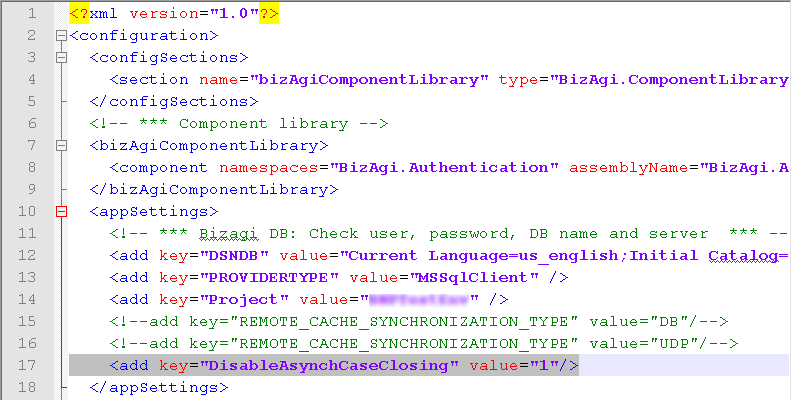 By default each Bizagi project operates with one instance of the Scheduler service. However, you can configure the use of multiple Scheduler services to work on a batch of background tasks in parallel. 1. Configuration of a high availability system architecture. 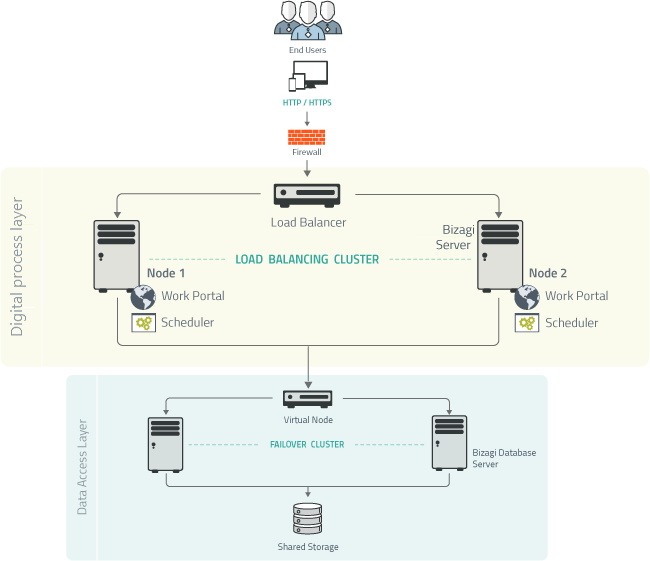 In this setup you would have a Bizagi cluster for load-balancing capabilities, each node having Automation Server operational with its 2 main components: Bizagi Work portal (web application) and the Scheduler. This way, your system architecture avoids single points of failure (should one node fail, the other continues operating avoiding service disruption). For more information about setting up a Bizagi cluster refer to Clusters and server management. 2. Scalability of the Scheduler. In some scenarios and depending on the specifics of the project's implementation, using more than one Scheduler service which processes the background tasks helps make sure that background tasks are not spending too much time in the queue. According to your specific analysis of the number of tasks that the Scheduler needs to process at one time(i.e sizing), and their expected SLAs, you could install and configure more than one Scheduler within the same server, without the need to do the same for the Work Portal (scaling out only the Scheduler). The steps described below, part from your project has already been set up (Automation Server properly configured, whether in a cluster or in a single-server system architecture). System maintenance carried out by the Scheduler involves moving information from transactional tables in the database and should be carried out during non-working or off-peak hours. When the system has multiple Schedulers, define which Scheduler will be in charge of performing system maintenance so that you can configure it as a "master" Scheduler. When a Scheduler service is ready to process tasks (according to the Scheduler interval definition, set as described in Bizagi parameters configuration), it will lock a batch of ten tasks even though it will work on one at a time, and it is uncertain how much time will it take to process the first one or the complete batch. Each batch of ten tasks, and background tasks processed by the Scheduler in general, follow a FIFO priority algorithm (a First in, First out queue). This implies that if the number of incoming tasks to process at a given moment (in a very short period of time), does not exceed ten, then it is likely that additional Scheduler service will not balance the load between them. Do this either through the Management Console clustering options or through manual installation. There are special naming considerations to take into account when installing multiple Scheduler services on a single server. Only one Scheduler is designated to perform system maintenance. Additional configuration oriented to the number of threads run by each Scheduler is optional to optimize parallelism. Create additional Scheduler services through the Management Console clustering options when creating a first Scheduler service in a given server. To view more information about setting up a Bizagi cluster that already includes an additional Scheduler, refer to Clusters and server management. 1.1 Create a copy (clone) of the Scheduler folder. 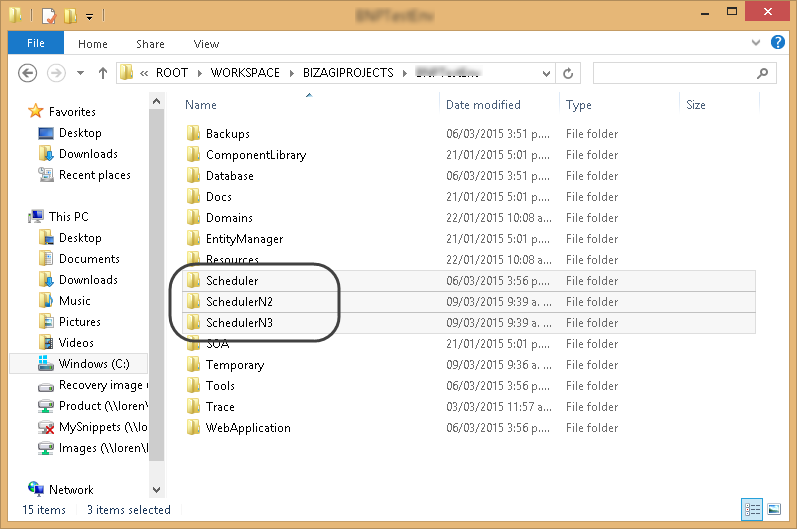 Copy, paste and rename the folder located by default at C:\Bizagi\Projects\[your_project]\Scheduler\. 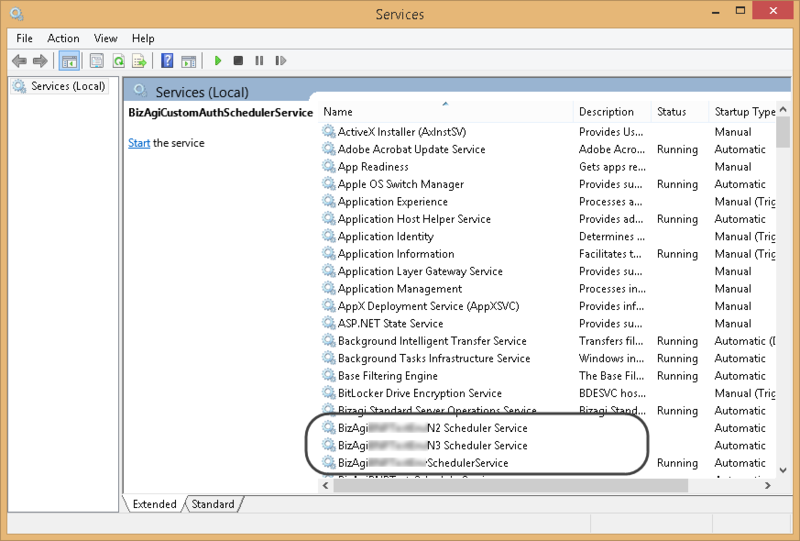 Do this for each additional Scheduler service you require in that server. 1.2 Edit the .bat files inside of the new Scheduler folders. As a best practice, edit all .bat files to render them ready when needed. In this example we are using the same root name, with a numbering suffix. 1.3 Run the installx64.bat (or install.bat if applies) file to install each new Scheduler service. Click the installation .bat file for your server's architecture to install the service. Do this for each additional Scheduler service you want to install. Do not start the multiple services at this point, as you need to edit their configurations first. Define which Scheduler services will perform maintenance tasks. Review all of your Scheduler services within the solution (only one among all nodes you may have in a cluster, including multiple services you may have in each node). You can call that one the "master" Scheduler, it does not not require further configuration. When configuring more than one Scheduler service in the same node, you must change the location of the temporary folder used by each Scheduler instance (this avoids issues that may arise when multiple services try to access the same files simultaneously). To specify a different temporary folder for reach Scheduler instance, edit the Project key by ensuring you use non-repeated, different values in each configuration file. <add key="Project" value="Scheduler1" /> and <add key="Project" value="Scheduler2" />. This key is especially useful when your project may handle a large number of asynchronous tasks executions, incoming in large blocks. When modifying the number of threads used by a Scheduler service (by default it uses one), consider an appropriate balance between the number of Scheduler services you will be using and the number of threads each one runs in parallel. Modifying this value should be properly analyzed and tested, according to your project's estimated number of background tasks, the characteristics and estimated processing involved in each of these tasks, and, most importantly, according to the characteristics of the underlying hardware (i.e number of cores and processors in your servers). We recommend that you monitor this value and tune it as needed while carrying out proper acceptance tests for this scenario to use the most accurate distribution. This key optimizes performance since it skips logging to the .csv file for thresholds and timeouts, and it avoids potential issues when having multiple services writing into the same file. Acknowledge that when having multiple Scheduler services, all of these services should be stopped before performing a process deployment. Similarly, with this setup, consider your multiple Scheduler services when upgrading your Bizagi version.